The weather forecast for the weekend wasn’t fantastic, so my lady and I decided to stay home and focus on domestic duties rather than heading for the hills where we’d probably get rained on. That didn’t sound like much fun! Saturday proved as damp as predicted, but Sunday dawned bright and sunny. Our resolve to focus on the chores lasted until lunchtime, whereupon we decided that a beautiful winter day like this was just too good to miss. A SOTA activation was needed, and fast. There wasn’t time to study maps or plan extensively. A quick check of the database showed that there was an unactivated 4 point Summit fairly close to home, and it looked as though it would be relatively easy to get to. This was VK3/VE-188, located above Yackandandah at the southern end of the Baranduda Range (VK3/VE-189) which we’d activated previously. On the way to that Summit we’d noticed an intriguing trail leading off Ewarts Road into the bush. This is Hodgson Lane, a 4WD trail that wends its way down the western side of the Baranduda Range to join the Wodonga-Yackandanda Road. 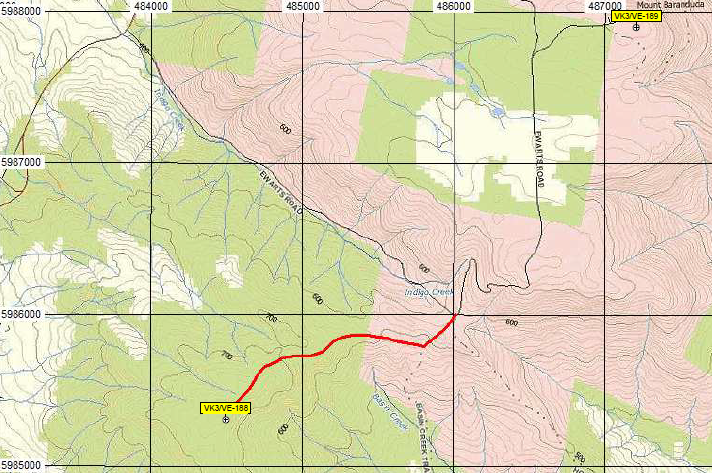 Just beyond the intersection with Ewarts Road, Hodgson Lane reaches a fork where Basin Creek Road leads on up the ridge while Hodgson Lane drops down the western slope. A little along Basin Creek Road another unnamed trail branches away to follow the ridge line, and this trail leads directly to the VK3/VE-188 Summit. Interestingly, this trail is not shown on many of the 1:25,000 series topographic maps of the area, but for some reason it does appear on the 1:250,000 map. The trail has been graded and is reasonably accessible, probably in a 2WD vehicle as long as you do it in dry weather. The trail climbs gently through eucalypt woodland, with occasional views down into the valleys on either side. Keen bushwalkers might choose to leave the car back at the Ewarts Road intersection and walk the 1.8km up to the Summit. The Summit itself is not clearly defined and locating it is easier using the GPS. There are plenty of suitable trees to provide support for the antenna. We arrived and had the station set up and on the air in our customary ten minutes. I noticed an intermittent fault in the BNC plug on the antenna feeder, but by jiggling it around a bit I got it to behave itself temporarily. I must remember to replace that BNC plug before the next expedition. I put up a spot on SOTA Watch and opened my account on 7MHz with a contact with Peter, VK3PF. When I signed off with him, over the following 20 minutes I had contacts with VK3BQ/M, VK2IO, VK2DAG, VK2GAZ, VK3DET, VK3ERW, VK3FQSO, VK3UH, VK1EM, VK2FAJG, VK3EK, VK5WG, VK2HV, VK2YK, VK3WAR and VK2NNN. This being a quick, off-the-cuff activation, once it all went quiet on 7MHz we packed up and headed back down the hill for a celebratory cup of tea. Unplanned, drop-of-a-hat expeditions can be just as much fun as the more highly planned ones. Fine, sunny winter days make for great SOTA conditions, but it gets chilly quickly once the sun starts to go down. You can’t beat a good cup of tea on arriving at home after a successful SOTA activation!